I’m happy to announce a partnership with MyDogTag.com and my Skype guitar, bass and ukulele lessons. While ordering custom dog tags for myself I noticed the option to create a custom dog tag for your guitar. How cool is that! 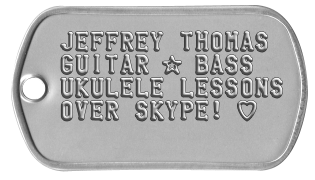 MyDogTag.com is offering a free single dog tag for you upon completion of a free Skype guitar, bass or ukulele lesson with me. That is a win, win for you. Click here to schedule your free lesson.